Does this router meet up to expectations? 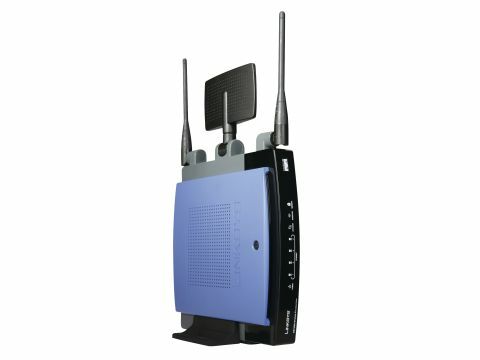 The Linksys WAG325N ADSL2 includes an ADSL modem, so if you make a £20 allowance for the modem, this is one of the cheapest routers around. This, you might think, is a good thing, but the stylists have conspired to make the Linksys look cheap and nasty. There are pieces of purple plastic cladding on the top and the bottom that serve no obvious function apart from carrying the Linksys corporate colour, while the middle antenna looks as though it was borrowed from Doctor Who's K9 circa 1977. From a technical standpoint, the Linksys has the all-important Draft-802.11n support, thanks to the ubiquitous Atheros AR5416 chip. However, the four Ethernet ports are 10/100 rather than Gigabit and there's no sign of the Ubicom StreamEngine that D-Link, SMC and ZyXEL include in their routers. To this end, it's a rather mixed bag of components that is starting to show its age. There's an undocumented button on the router with a picture of a padlock moulded in that appears to enable and disable security. That could come in handy if you want to connect a Skype phone temporarily, but it goes against the spirit of WEP and WPA2. Once you've dug out the log-in details from the quick start guide, you'll find the configuration screen is an uphill struggle. It is laid out in black and purple and is something of a pain to navigate. Added to that the configuration screen flashes every few seconds, presumably as it checks the current status of the settings. The choice of wireless modes is also minimal and when we changed the SSID name the router restarted without warning and then presented us with a 'page not found' error. There's clearly work to be done here.